Get a taste for some interesting Easter traditions and beliefs from around Europe! Sabine, Germany: Easter egg hunt outdoors. My brother and I always ran outside the back door to be the one to find the most eggs. While we searched, my parents would put a 5 Mark coin down by the doorstep (back when they were special!) for each of us to find on our way inside. We never understood how we had missed the bunny putting it there. I do this for my daughter too. 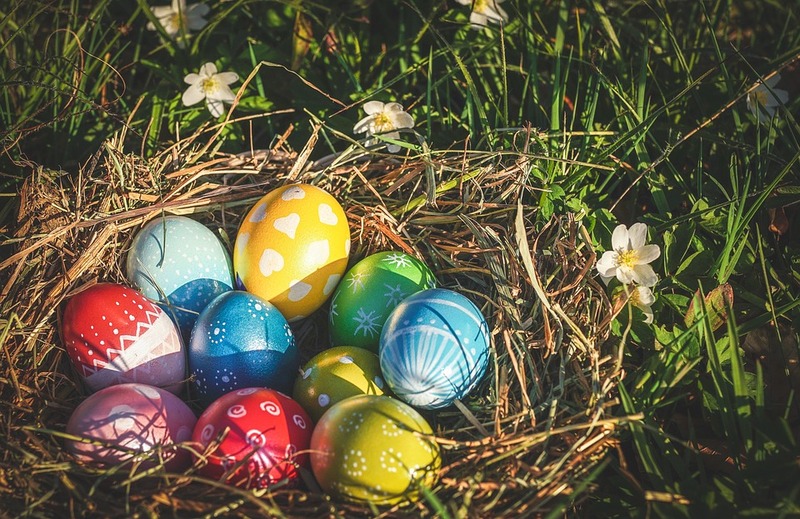 Anna, Poland: Easter egg hunt in garden or (weather permitting), Easter brunch with egg fight, Easter basket and egg dyeing. A big Polish tradition is to dye eggs different colours and prepare a festive Easter basket to bless at church on Saturday. When the kids were smaller, each also prepared and took their own, small basket. Another typically Polish tradition is to eat a festive brunch on Easter Sunday. The brunch starts with a battle of the hard-boiled and dyed Easter eggs, which is explained below in the Russian traditions. This is our kids’ favourite part of Easter. On Easter Monday, known as Wet Monday (lany poniedziałek or śmigus dyngus) people spray and soak each other with water! Dates back to 14th century. Def not my favourite tradition – it’s way too cold! Daria and Anna, Russia: Easter in Russia is called Paskha. Russians celebrate Easter with decorated eggs, special foods and customs. On Easter morning most families will eat a traditional breakfast of eggs, kulich (кули—a special kind of Easter bread, and paskha—a pyramid-shaped cake made of cottage cheese and raisins. Sometimes the food is blessed by the church before being eaten. In Russia, there is no custom of chocolate eggs or bunnies. Russians dye real eggs for the celebration. Traditional ways of dyeing eggs include using red onion skins collected for this purpose or other commonly found natural dyes. Egg Fight tradition: each person has to choose one egg and hit the tip of somebody else’s egg with his egg. If the shell of your egg doesn’t crack, you move to another person. The winner is the one with the strongest egg. Another popular egg game is rolling the eggs along the floor or down a slope, and the one that reaches the base without breaking wins. Tamara, Serbia: Egg has a strong and important position in old Serbian believes, with roots in pre-Christian tradition. It is the ultimate symbol of the life force. In Serbia coloured eggs are central to Easter celebrations. The first egg we colour must always be red and that egg is set aside in a special place and kept until the next Easter. We call this egg čuvarkuća, which literally means “the guardian of the house”. This egg represents the unity of the family and household, as well as the preservation of the life force. When the next Easter comes, a new, freshly coloured red egg replaces the old one. Martine, France: Traditionally we celebrate the death of the Christ on Friday and His resurrection on Sunday. Christian families eat lamb on Sunday. Church bells are silent from Thursday to Holy Saturday. Legend says the bells take the opportunity to go to Rome to be blessed and bring all kinds of chocolates back for children. Crossing France, the flying bells “lose” chocolates in the shape of eggs, hens, lambs, rabbits, to the delight of children. Parents hide these chocolates in the garden and the kids participate in an egg hunt!